Today my blog is three years old. Happy birthday to it! I wanted to do a little something for the occasion, but time hasn’t been with me so far. I’ll have a suprise for you as soon as I can finish it, so don’t go too far. In the meantime I’ll let you enjoy this picture of a beautiful (and more important… yummy!) cake a japanese friend made for my birthday a few years ago. She is a pastry-cook and she is very talented! 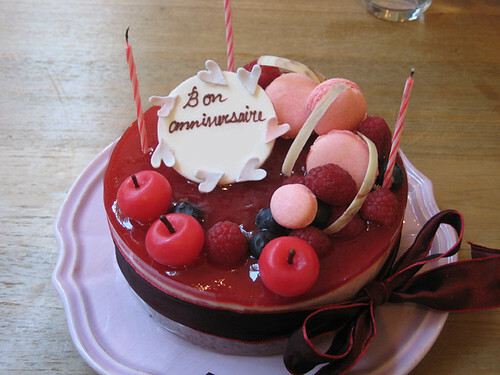 I’m getting hungry just to look at it… The writing says “Happy Birthday” in French. Hello! It’s now May 27 and I guess you’re all wondering who won the giveaway. First I want to say a big thank you to all who took part in it and left nice comments. I was happy to see that most of you took the time to leave a little something book related. I read each of your comments as I received them and it was really fun to read about what you like to read, which authors you recommend or the little stories you shared. Some books and authors I know and love also,others I don’t know and will check. So thanks to all! Congratulations! I love old books too, love the smell and the nice covers. I have to say I’m more drawn towards sewing or fashion related old books though. I’ll send you an email to get your shipping info. Now as promised it’s my turn to share something, since you all did. If you can understand French I advise you to go read the French version of this post (just click on the French flag at right), since I’m talking about a book I loved. This book is only published in French, so it didn’t seem fair to talk about it here, since you can’t read it. Instead I’ll give you a very happy book-related memory. Reading is something we love in the family. And both my father and I really like science fiction books. When I was in highschool a friend of mine’s mother was working with an antique dealer. One day she tells me that he received what seemed to be the whole content of someone’s library, with only sience fiction books, and maybe we would be interested. You bet we were! We took an appointment with him, and since it was during the week I was allowed to skip school (something my father never allowed!) and go with him to check the books. We came back home that day with the car chock full of boxes, themselves full of books. We removed the back seats, so you can guess that even if the car wasn’t very big, it was still a lot of books. We spent weeks after that browsing through the books and choosing which ones we’d keep and which ones we’d give away or sell. I got to keep many books that my father wasn’t interested in. I still haven’t read all of them. ^^; It is one of the best book related memories I have! Thank you to all those who entered the giveaway so far, leaving nice and interesting messages. ^_^ You officially still have until 5p.m. Pacific Standard Time tonight to enter (that’s about 2a.m. here in Paris…). Today I’m adding a new page to the site, which provides a list of pattern brands I know. A colleague and friend of mine recently started sewing. We have sewing sessions at my place every wednesday, it’s really nice. It’s fun to have a sewing buddy with whom I can talk about blogs, patterns, outfits, fabrics and all without being afraid of being boring, and to go fabric shopping with during lunch break sometimes. Since she’s new to sewing she doesn’t know much about pattern brands and was asking me for some info and some links. I thought it would be nice and useful to have such a list here. I can give the link to her, go back to it later if I’m looking for a pattern company’s website and anyone who stops by can read it and maybe discover new interesting patterns! I tried to organize them by types for easier search. I’ll add new pattern brands as I discover them. And of course if you want to share a pattern brand you know that isn’t in the list, please leave a comment on the page. You can even add some background info or customer feedback. The link to the page can be found just under the header image. Edit from 27/05/2012: the winner is Snoodles! Go check the full post here. 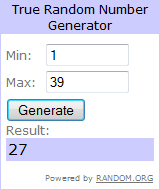 Edit from 26/05/2012: the giveaway is now closed! I’ll draw a winner and announce it here during the week-end. Thank you! Here it is! Today is May 21st, also known as Giveaway Day! It’s also a big day for this blog as it moved and just got its own hosting and domain name. It had been in my mind for some time. At first I was thinking about doing it for it’s third birthday next week, but when I discovered the date of the new Giveaway Day I decided to rush things a little. It will be much easier to read, as the French and English versions are now separated (but it’s easy to switch between the two with the language buttons!). There might be a few things to tweek still, but I think I solved most minor problems that appeared after the move and this blog is ready for you. ^^ So, in honor of my blog getting back to life before its anniversary and getting its own domain, and also just because it’s fun, here is my giveaway for Giveaway Day. My first giveaway! I’m offering a book cover that I made especially for this occasion. The pattern was inspired by similar book covers I saw in Japan. 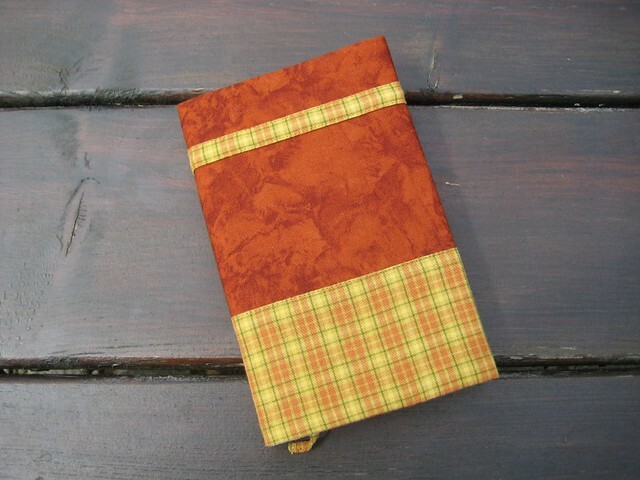 I’ve been using one myself since last summer (when I first drafted the pattern), and I have to say it’s very useful. I go to work by train each day, so I always carry a book in my bag, and they are now nice and protected thanks to this. It is meant for small books (paperback books I think in English, right?). It’s based on French books but since the british/amercian books I own are smaller than my French ones, it should be okay for most books. 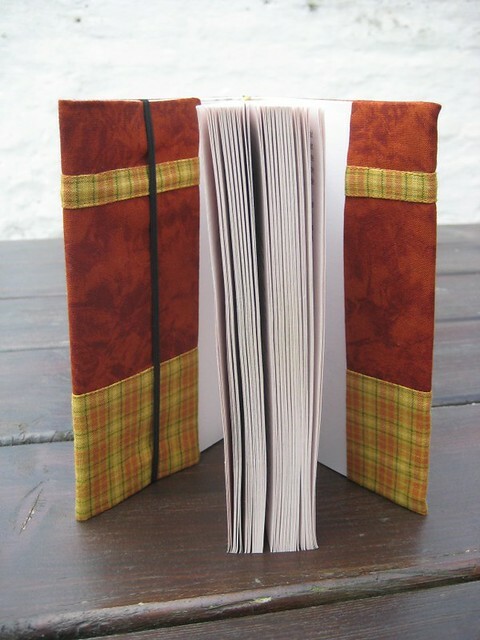 The size is adjustable: there is a flap that you fold around the front of the book and then maintain with an elastic. That way you can still use the same cover even if you have books of different thicknesses. 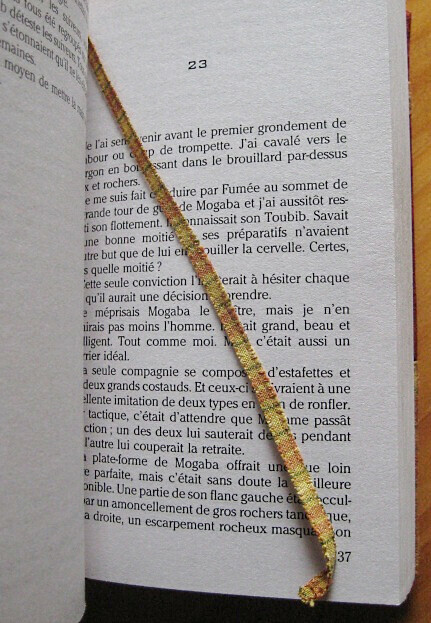 There is a bookmark that match the front fabrics so that you can find where you stopped easily. The cover can be washed: it’s made of different cotton fabrics (even the inside lining) and all have been prewashed to prevent shrinking. So how can you win it? It’s very easy: just leave a comment on this post. Any comment will do, but if you want to leave something nicer, I’d love to read anything book-related: a book or author that you recommend and why, a book-related memory, when you enjoy reading the most, what style of litterature you prefer, a book-related accessory you like… If you do I will also find something book-related to share when I announce the winner. ^_^ Comments are open until early morning on the 26th (since it’s UTC+2 here) and the winner (randomly chosen) will be announced by the 27th. The giveaway is open to anyone anywhere in the world. 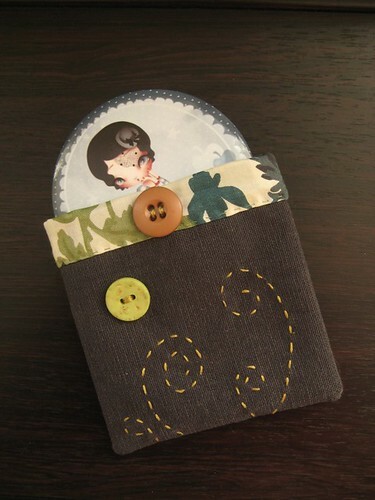 And make sure to go check all the other giveaways on Sew Mama Sew’s blog! Hello! Before I continue with another longer post with more things to read, I thought a picture sewing-related post was in order! 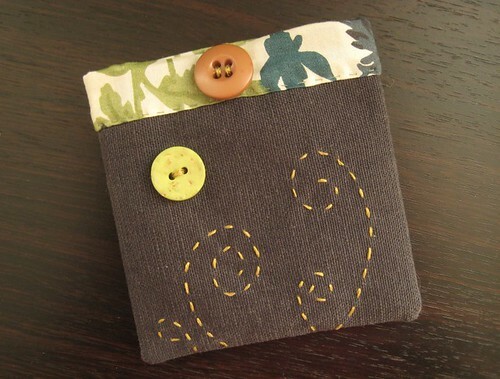 Sadly I didn’t have enough time at the end of 2011 to make lots of nice handmade Christmas gifts, but I did manage to make one: a little pouch for a mirror I was giving to my sister for Christmas. The shell fabric is a medium/heavy weight cotton for durability and sturdyness. The lining fabric is a Liberty Tana Lawn (I don’t know this print’s name), so that it’s pretty on the inside and soft against the mirror. The lining folds on the main fabric at the top to add a decorative band. 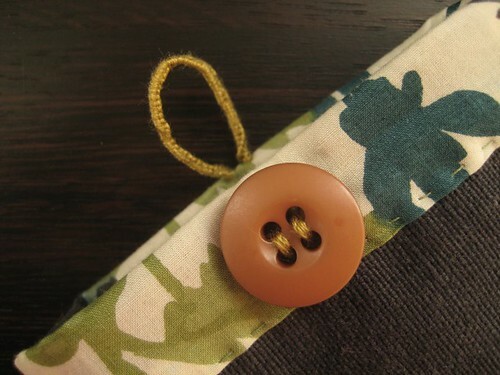 The front is embroidered and adorned with two buttons. One is purely ornamental and the other is also functional: the pouch closes with a loop that goes around the central button. My sister seemed quite pleased with her present, it made me happy. And because I’m sure your wondering where the cute little mirror came from: it was designed by Adolie Day for La Marelle. Without a doubt, everybody is supposed to know, and everyone think they know what is to be done, what we should do when we get married, when we give our son or daughter in marriage, or when we’re simply invited to a wedding. However, how many mistakes are done by those exact persons who think they’re extremely knowledgeable in the worldly usage! 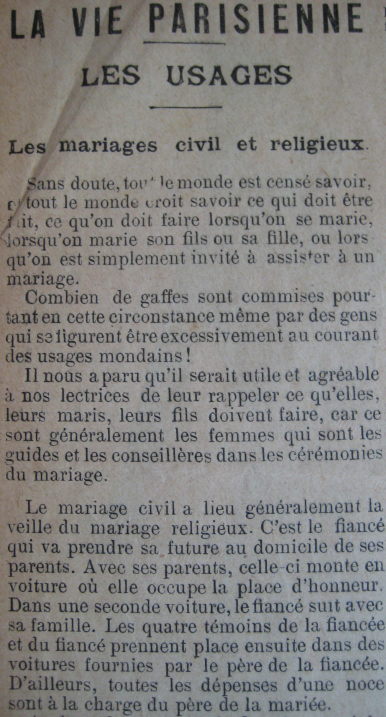 It occurred to us that it would be useful and pleasant for our readers to remind them what they, their husbands and their sons must do, because it is usually women who are the guides and advisors in wedding ceremonies. 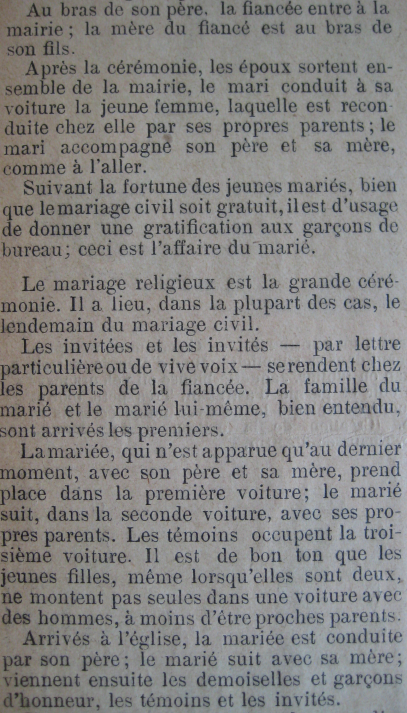 The civil wedding usually happens the day before the religious wedding. The fiancé go pick his bride at her parents’ home. She gets in the car with her parents, where she has the place of honor. The fiancé follows in a second car with his family. The bride and groom’s four witnesses then take a seat in cars supplied by the bride’s father. Besides, all of a wedding’s expenses are at the charge of the bride’s father. The bride enters the city hall with her father; the groom’s mother enters with him. After the ceremony, the newlyweds exit together from the city hall and the husband brings the young woman to her car, where her parents are waiting to take her home. The husband goes with his father and mother, as he did on their way in. 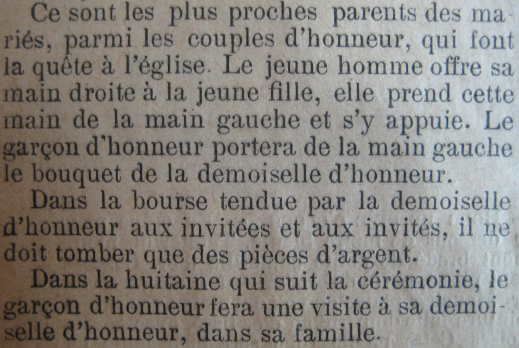 Depending on the young couple’s wealth, even if the civil marriage is free, it is customary to give something to the city hall lads; this is the groom’s responsibility. The religious wedding is the biggest ceremony. It occurs, most of the time, the day after the civil wedding. The guests, either through a letter or through vocal invitation, go to the bride’s parents place. Of course, the groom and his family arrived there first. The bride, who appeared at the last moment with her father and mother, goes into the first car. The groom follows in the second car with his own parents. The witnesses are in the third car. Young girls, even when there are two of them, shouldn’t go alone in the same car as men, except when they’re close family. In the church, the bride goes with her father; the groom follows with his mother; then come the bridesmaids and best men, the witnesses and the guests. It isn’t necessary, of course, to remind you that ladies take the left arm of their partner. The father of the bride leads her to her place. After the ceremony is over, the couple, together with their parents, receives their guests in the sacristy. 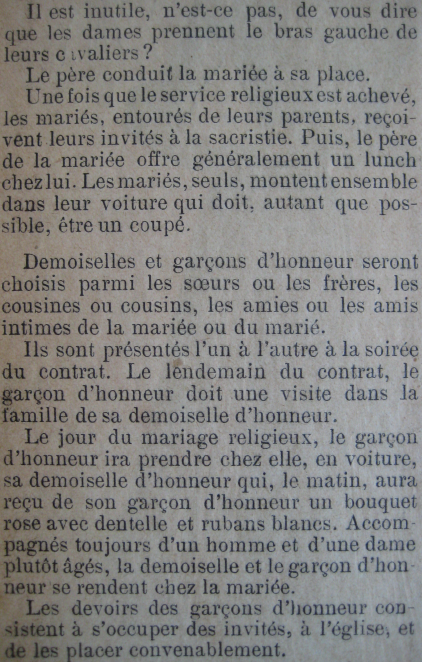 Then the bride’s father usually offers a brunch at his house. The couple gets alone in their car, which should be, if possible, a coupé. Bridesmaids and best men are chosen among brothers and sisters, cousins and intimate friends of the bride or groom. They are introduced to one another during the contract evening. The day after, the best man is to pay a visit to his bridesmaid family. The day of the religious wedding, the best man will go take his bridesmaid at her house, with a car. The same morning she would have received from him a pink bouquet with lace and white ribbons. In the company of an older man and lady, they will go to the bride’s place. The best men’s duty is to take care of the guests at the church and seat them properly. The closest relatives of the bride among the bridesmaids and best men take care of the charity. The young man offers his right hand to the young lady, she takes it with her left hand and rests on it. The best man will carry her bouquet in his left hand. 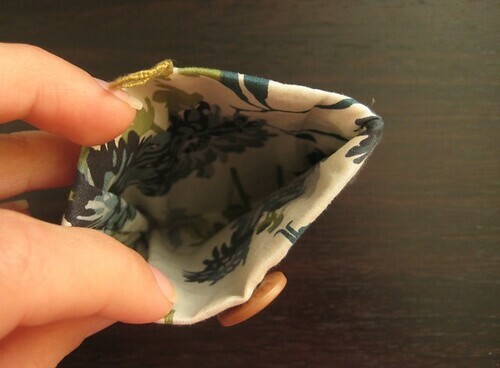 In the purse presented to the guest by the bridesmaid, only silver coins should fall. During the week following the ceremony, the best man will pay a visit to his bridesmaid, in her family.